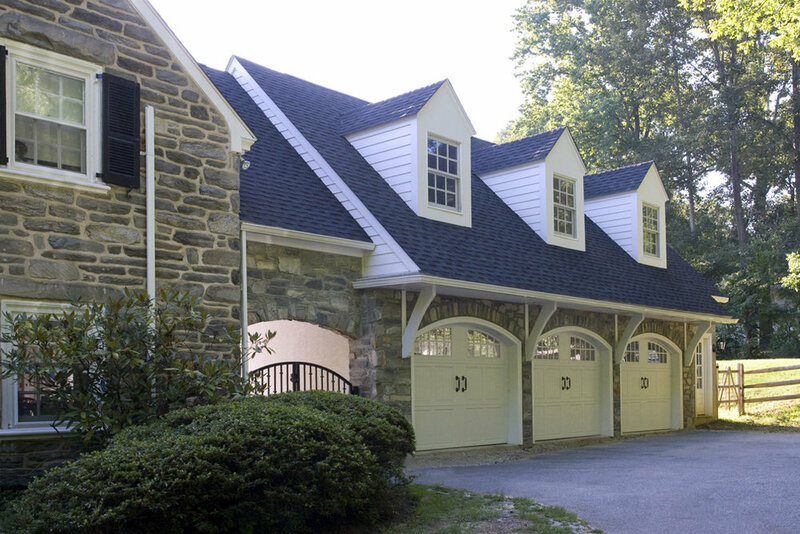 A client came to us for a garage addition on their 1920's stone home. The job eventually expanded into including a patio and pool deck for a new pool they had installed while we were working with them. Here the garage foundation walls are going in. Roof framing and sheathing going on. A new hallway was created to allow access from the second floor of the home into the addition, which created a nice breezeway underneath. We took stone from the original house that was obtained during the second floor demolition to attach the addition and used it on the exterior of the new garage to help blend it into the original structure. The upstairs room has a great view of the pool below. Here, the gas fireplace unit has been installed and stone has been applied to match the garage and house. The blockwork for the retaining wall is in place, which separates the lower patio from upper patio/pool deck.